As I've been on holiday in Cornwall this last week, it only seemed fair to dedicate my Mug of the Month to my recent travels. One of my favourite little seaside towns in Cornwall is Padstow - also known as Padstein due to the monopoly chef Rick Stein has with 14 establishments, including restaurants, hotels a deli and a seafood school. This beautiful little harbour town was buzzing with hundreds of tourists on a sunny Sunday afternoon, with every other family accompanied by their treasured canine companion. All shapes and sizes milled through the town, watching their owners slurp on Cornish ice creams and hoping for the chance of being fed a leftover bit of pasty. Fellow dog lover Rick Stein was known for his terrier Chalky, who's little face appeared regularly on his TV cooking shows. Sadly Chalky passed away in 2007, but this whiskery face still graces many gifts in Stein's shop. 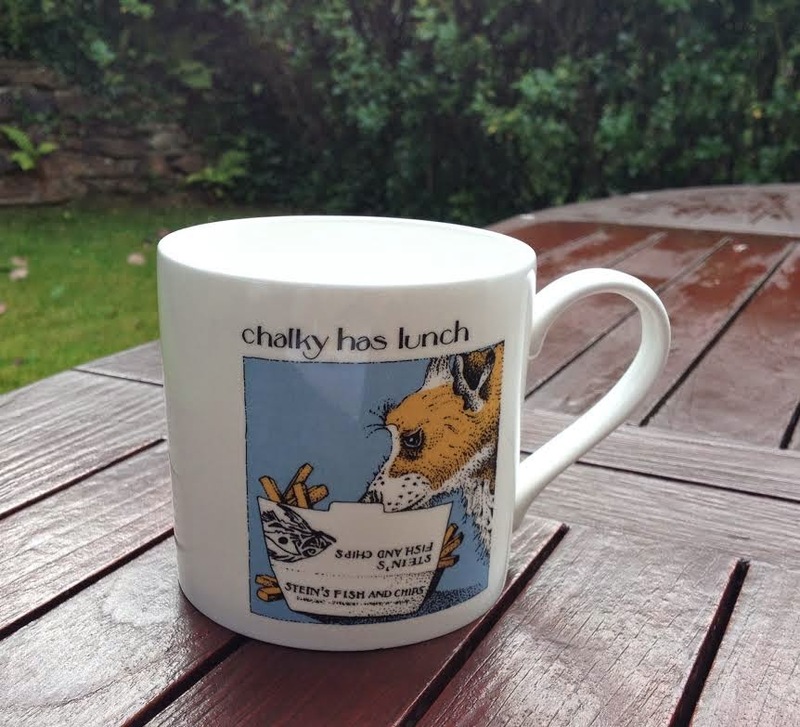 And I couldn't resist this Chalky mug as Mug of the Month for July. 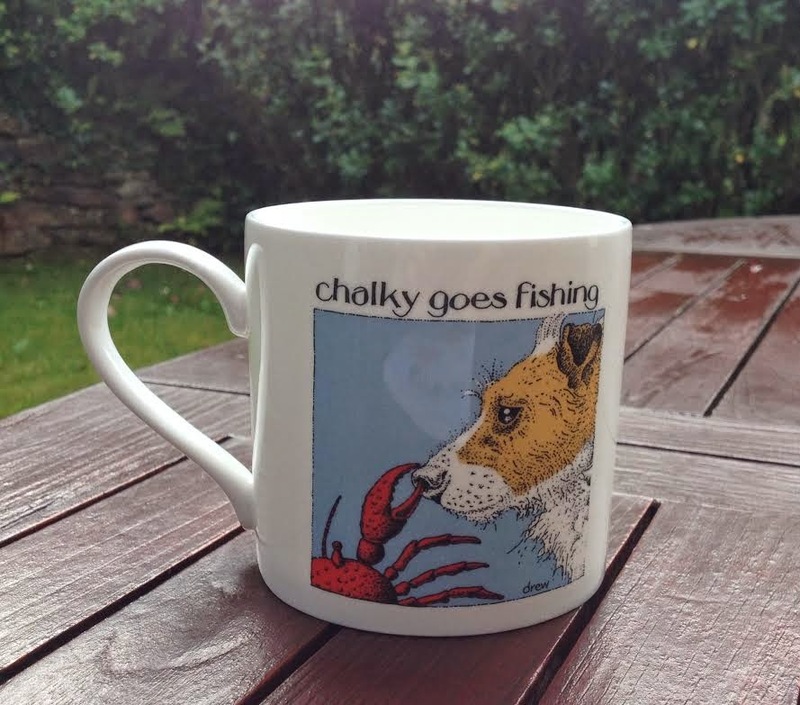 Perfect for a beachcomber's morning cuppa, or even tea time with fish a chips. And Chalky isn't the only one to devour some of Stein's fish and chips, we queued a good 40 minutes for some of the best fish and chips I've ever tasted. 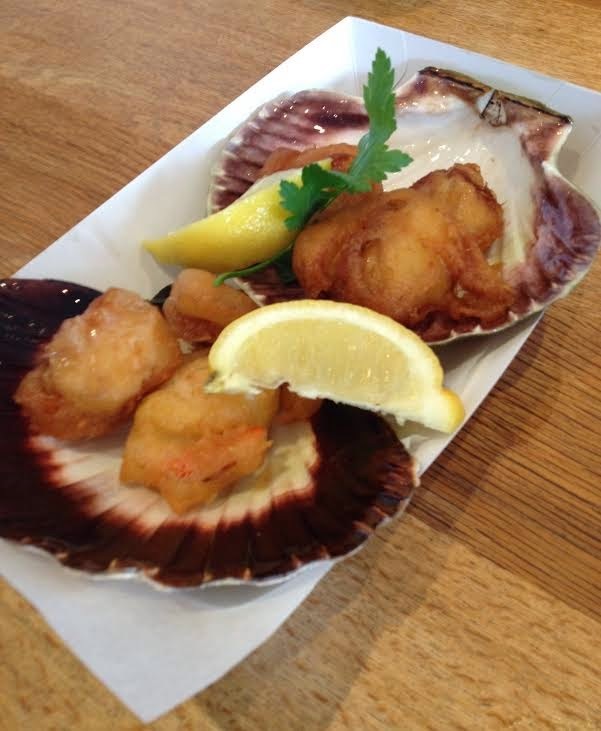 The star of the show were the deep fried scallops - succulent and piping hot encased in batter made from beef dripping - they were to die for.But I'm already a big scallop fan. The day before we went to St Petroc's, Stein's second priced restaurant in Padstow (sorry but averaging £30 for a fish curry, his top priced Seafood Restaurant was a no-go). But the St Petroc's bistro was fairly reasonable, and after a rhubarb and prosecco cocktail, I had the baked scallops which were cooked in a rich decadent golden juice of truffle butter.